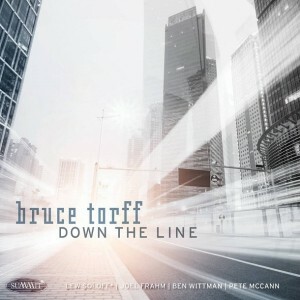 Chicago-born composer and keyboardist Bruce Torff (brother of bassist Brian Torff) follows his 2013 album “Look Again” with “Down The Line”, a highly enjoyable and versatile recording with a stellar cast of players and some well-rounded and honed compositions. The main featured instrumentalist here is Joel Frahm on sax who graces the 11 tracks with his inimitable, soulful sound. There is a Brecker Brothers-ness on the opening funky “Enceladus” with Joel improvising over a subdued and behind-the-scenes keyboard carpet and a really cool solo by the leader. The fusion-y sound of the electric guitar by Pete McCann on the title track is a welcome addition to the palette and only enhances the otherwise infectious, groovy tune. The tempo is at half throttle on “Wave Of Silence” where both Joel and Pete move to the forefront on what turns out to be a pretty atmospheric piece. Bruce is also playing all bass parts, but never goes the corny route thank heaven. But still, “Tribal Function” not really works for me – it just sounds too much like a studio jam, albeit fun track. There is a certain tragic to this album, as trumpeter Lew Soloff contributed to two pieces only two weeks before he passed away. The beauty of his playing on “This I Promise You” is deeply moving. And the exchange between him and Joel only adds to the magic of the piece. “Well Of Tears” reminds me of some Steely Dan stuff of the early 80s, circa “Gaucho”. Another intricate and grooving tune. The light and breezy, Brazilian-tinged “Beginning To End” features some keyboard vibes work by the leader as well, adding yet another touch. The impetuous and a bit tumultuous “Last Dispatch From The Road To Hell” is too uneven for me, but has a great title! More Brazilian sounds can be heard on “Memoriam” with a gentle guitar and endearing drum work by the great Ben Wittman and on the slightly faster “Once And For All” where Joel has another of his ample solos. I need to check out more of his stuff. His tone is superb. The second song with the late great Lew Soloff on his final recording before his sudden death opens with some sweet piano tinklings before Lew sets in on a reggae-fied section of “Early Sunday”. Where’s the croissant and the coffee?